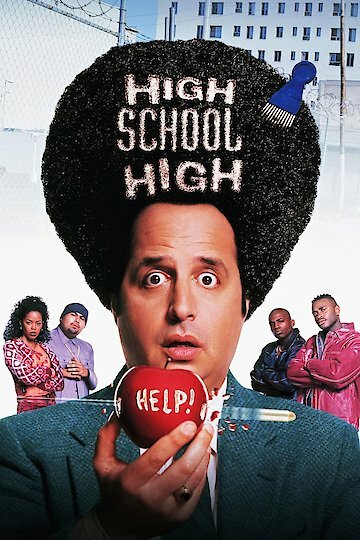 "A Dangerous Mind is a terrible thing to waste"
"High School High" is a comedic parody movie starring Jon Lovitz that centers on a new teacher at a Los Angeles inner city high school. Starring alongside of Lovitz were, Tia Carrere, Louise Fletcher, Malinda Williams, Natasha Gregson Wagner, Brian Hooks, Malinda Williams and Mekhi Phifer. Lovitz stars as Richard Clark. He's taken a new assignment at a tough as nails school where they have a full time SWAT team on duty. Tia Carrere plays a fellow teacher, Victoria Chapel. The two have a love connection and try to find a way to improve the school. Some of Clark's students include Griff McReynolds. He plays a former Los Angeles gang member who has aspirations to graduate high school and wants to someday be a teacher himself. He also has Julie Rubels in his class, she is not only a single teen mom, she has multiple and a seemingly uncountable number of children. Another character who brings a lot of laughs is Anferne Jefferson. Anferne is a comedic character parody of a slow witted gang member. Every feel good story needs an antagonist and Clark's big enemy is the school principle, Evelyn Doyle. She does everything in her power to have him fail. Despite many obstacles, Clark and Chapel manage to get all of the students to care about school again. They help to solve the problems for the group of misfits and do battle with the evil principal. Late in the film we find out why Principle Doyle was so against Clark cleaning up the school. She is revealed as a drug dealer and gets sent away. We do get our happy ending when Griff graduates and is named valedictorian. The school gets a surprise when a new principal is hired. The film has constant stream of jokes throughout the movie. "High School High" spoofs many different dramatic school dramas. A majority of the jokes includes comedic takes on films such as, "Dangerous Minds", "Lean on Me", "Stand and Deliver" and "The Principal". High School High is currently available to watch free on Crackle and stream, download, buy on demand at Amazon, Vudu, Google Play, FandangoNow, iTunes, YouTube VOD online.